Previous to this exhibition, I had never heard of East Street Arts, never mind Patrick Studios. It’s hard to determine in my mind whether their off-the-beaten-track location is a good thing or not, they’re certainly the most positive thing going on in that area (cue ominous barbed walls and dated concrete buildings). I was invited along to a new endeavour of theirs – an Artists’ Talk prior to viewing the work on display, which was held two hours before Augure’s (and Pégase’) general opening. It was to take place in the Patrick Studios’ kitchen where we were enthusiastically encouraged to sit down by ESA co-founder Jon with a choice of beverage. I was very impressed by the selection by the way, from tea to beer; within the first ten minutes of being there I was sure I was exactly where I was supposed to be out of the whole universe. When Sociéte Volatilé artists Philémon and Arnaud Verley, arrived and sat in front of us, the audience’s faces lit up, keen to hear what the guys had to say. This may have be down to that strange effect the French have on us Brits or could just have been fellow artists taking an interest, who were obviously in attendance, as I observed a lady in front of me sketching. As the concept of Augure, French for ‘Seer’, was revealed it was endearing how little English they could speak but they didn’t have to be fluent to get their point across. They explained how the Lille-based organisation that brought them thus far (Sociéte Volatilé) inspired the incorporation of feathered aviators in their work. The use of birds in their previous efforts, such as Les Dupes, represented the desire to fly and to escape to wherever the flappy-winged creatures desired. Augure fuses this symbolism with the human form, summarising the tragedy of wanting nothing more than to escape one’s own skin and the societal shackles that weigh it down. 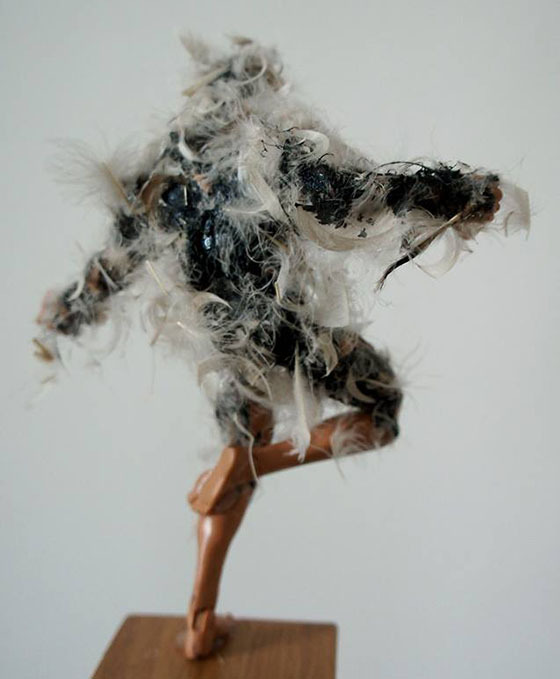 I’d seen the tarred-and-feathered action figure which they modelled the sculpture on, but now that I had a little context to the piece I was actually pretty terrified as to what I was to witness in the Open Studios upstairs. We were led up to a freezing-cold room, into what felt like a freeze-frame. 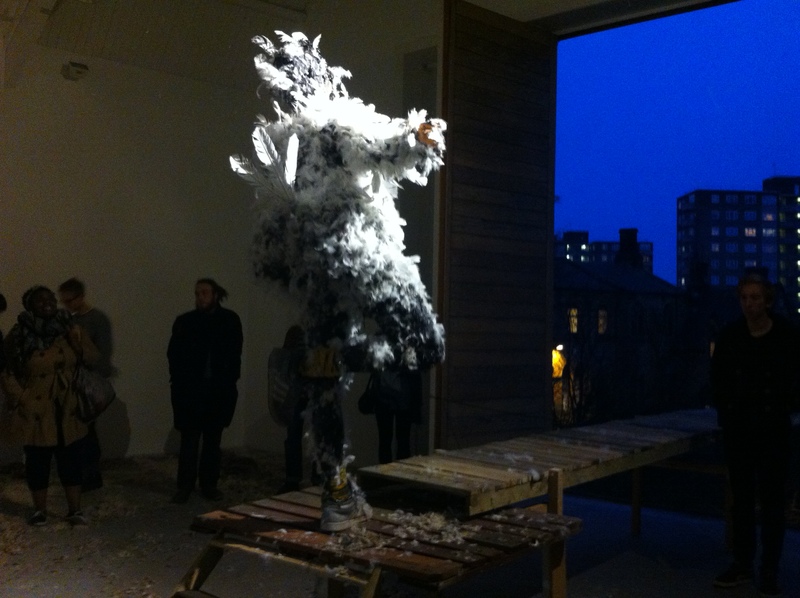 A man, tarred and feathered, perched on one leg in the centre of the room, on a crude diving board structure that literally stuck out of the building into the cold January air. 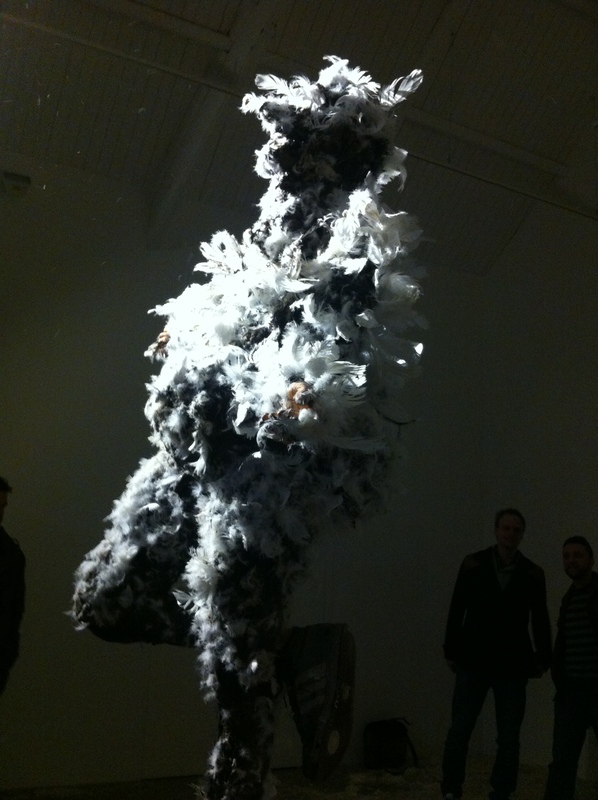 The second thing to catch my eye was the floor, covered in delicate feathers in shades of cream and brown, giving the impression of a struggle, or something that would cause the feathers to drop in such a way. The sculpture set in motion a series of imaginary events in my head, as to what could have happened in there. He had an unsophisticated rump with three feathers starkly protruding out of it – it was as if this man had frozen mid-metamorphosis, into a hideous Icarus-type creature. It was near-impossible to capture the expression on his face but still the look of tortured anguish was there, made worse by his stiffened posture. It was as if this man was so desperate to escape himself, he threw open the shutters and hurriedly considered whether to end it all. 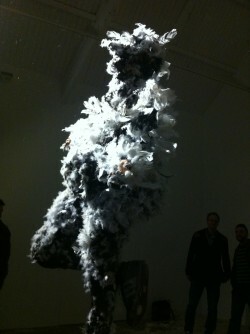 His reaction to the situation so extreme that his skin began to ooze a jet-black liquid and feathers began to sprout. Realising what was happening to him he thrashed about the room in disgust screaming, trying to shake off the change. Eventually, he could fight no longer, stepped up onto the board and prepared for launch. This is where time had frozen him. I was thoroughly shaken up after taking all that in so the drinks, pizza and mingling with creative types that followed was warmly welcomed. As previously mentioned, Philémon and Arnaud were in fact showcasing two works, the other being Pégase. This is a short film made by the artists to comically communicate the pointlessness of new technology when traditional methods sometimes prove just as worthy. 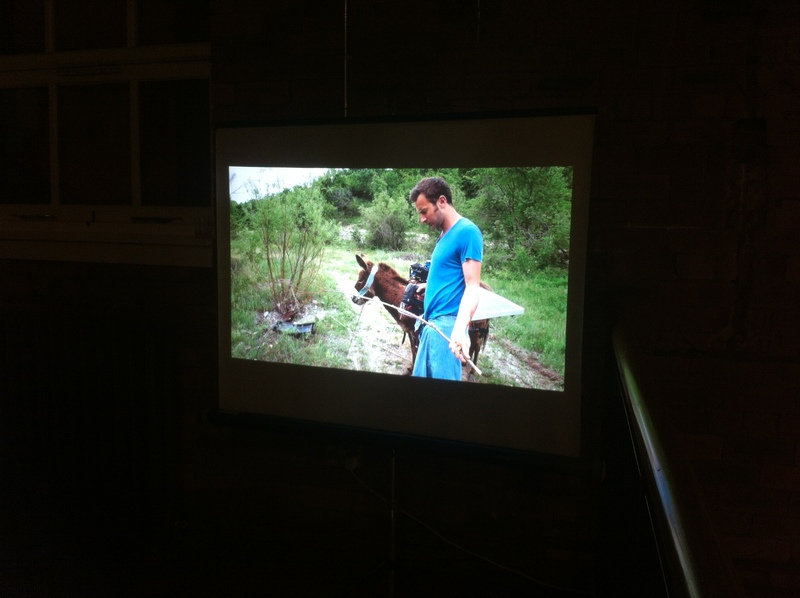 Essentially the piece involved travelling around rural Macedonia with a donkey that had solar panels strapped to its back, along with a very cute Macedonian flag. This juiced-up animal was able to power a lawnmower, demonstrating a hilarious irony as the donkey nibbled at the grass whilst it was simultaneously being mown. The absurdity of the electric shaver, saw, and the lamp that the men used and carried around with them as they endeavored in the tradition of camping proved highly effective in proving its point. One of them said during the talk that “People think that solar panels will save the world, but it won’t. We need to change what we’re doing instead of making all of this new technology”. Philémon and Arnaud may have a point. 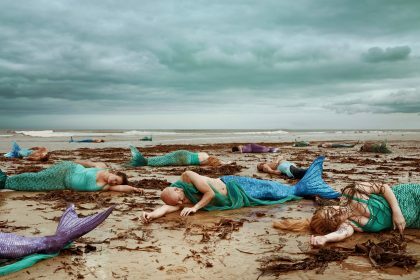 It’s a great shame that a large proportion of people, particularly students such as myself, feel that art is inaccessible to them, and so rarely get to experience art in all its wonderful forms – that great looming question ‘what’s the point’ hanging over our heads whenever it’s brought up. From attending the exhibition, I can say with confidence that that is exactly the question that people should be asking. It wouldn’t be wrong to expect big things from Sociéte Volatilé and its contributors, and I’ll very much look forward to what East Street Arts have lined up next! Leeds, we’re in for a treat. More information about Sociéte Volatilé here!